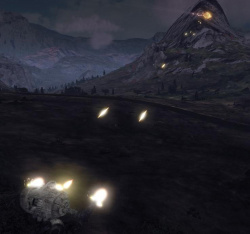 Rotary AutoCannons, or RACs, are weapons which produce rates of fire beyond that of even Ultra AutoCannons, resulting in weapons with the highest rate-of-fire in the game. A pre-0.6.0 Uziel B shows off the RAC2. The Rotary AutoCannon make use of multiple barrels, allowing for a higher rate of fire by giving each individual barrel some time to cool down, resulting in a (relatively) high caliber gatling gun. In addition to their high rate of fire RACs have slightly improved damage compared to their Standard AutoCannon or Ultra AutoCannon counterparts, although this does come with a serious reduction in weapon range. Even with their multiple barrels RACs are prone to overheating under sustained fire. In addition the RAC2 and RAC5 both have a nasty habit of jamming during intense use which requires a trip to a repair bay to correct. Only Inner Sphere Vehicles and BattleMechs may mount the Rotary AutoCannon. The astounding rate-of-fire of the Rotary AutoCannon-2 and Rotary AutoCannon-5 make them especially effective in the anti-air role or against enemy Battle Armor. They excel at the destruction of softer targets, and thanks to their high damage-per-second perform acceptably against heavier targets (the RAC5 more so than the RAC2). Unfortunately their reduced range makes means that they typically end up in the range brackets of heavier AutoCannon, such as the UAC10 or the LBX20. In addition, their rapid ammunition consumption and tendency to jam during intense firing make them poorly suited for short-range slugging matches. The Rotary AutoCannon was developed by the New Avalon Institute of Science in 3062 and is both bulkier and heavier than Ultra-class AutoCannons. In addition, the expense of construction and inability to make use of specialty munitions have prevented it from being developed for the heavier AutoCannon calibers. Offsetting these factors, however, are the RAC's ability to fire at up to six times the rate of a Standard AutoCannon. While the weapon is prone to jamming at higher rates of fire one significant improvement over Ultra AutoCannon is the ability to clear the jam in the heat of battle. Although initially developed and produced by the Federated Commonwealth, the FedCom Civil War saw the RAC quickly disseminate to other Successor States. Currently the Clans have yet to develop an RAC of their own. This page was last edited on 16 April 2019, at 15:14.